1. Cut butternut squash in half and remove seeds. Place face down on baking sheet. Add about 1/4" of water to baking sheet. Bake at 400˚ for about 25-30 minutes or until squash is softened. Cool then peel away outer skin and slice into bite-sized chunks. 2. 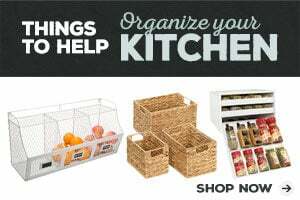 While squash is baking, cook orzo according to the package but add chicken bullion to the water for additional flavor. When done, drain and set aside. 3. In a pan, melt butter and add diced shallots. Cook over medium heat until shallots as transparent. Stir in sage. 4. Return drained orzo to the pot it cooked in, add in butter and shallots then lightly toss in cubed butternut squash and feta cheese. Add salt and pepper to taste. Transfer to casserole dish and serve warm. Or refrigerate and reheat in oven prior to serving. Did you guy see that very large casserole dish of velvety roasted butternut squash, orzo, feta and sage up there. Did you see the SIZE of it? Yeah, I could and probably will eat that entire dish. No shame. It’s really that good. Like, GOOOOOOOOOOD. It’s not often I find a recipe that has a short ingredient list like this that is full of rich, creamy flavor. So when I do… I eat. It. All. There are so many things to love about this simple butternut squash recipe that I’m gonna go ahead and list them out. Roasted butternut squash is like eating a tiny bite of fall. It’s a bit sweet, creamy and earthy. It’s healthy! With a hearty dose of vitamin C, butternut squash is a perfectly delicious way to prep for cold season. Orzo has twice as much protein as rice, so it fills you up for longer. It’s a perfect and super easy Thanksgiving side dish. I could go on about how much I love feta and how it perfectly compliments the sweetness of the butternut squash and how shallots are the beautiful marriage of onions and garlic but I’ll spare you the mushings. Making this again and want to try a variation? Try adding in spinach! Just through in a handful or two of fresh spinach leaves in when you’re cooking the shallots. They just need to wilt a little and then they’ll stir in perfectly. Add some rotisserie chicken and it’s a complete meal in one dish. Try using risotto instead of orzo. What is the difference between risotto and orzo anyway? Risotto is actually a rice. Orzo is a pasta. “Risotto” refers to the method of cooking rice where you basically infuse the rice with flavor, typically by cooking it in broth. Orzo on the other hand is an actual product you can buy. It’s not a grain like rice. Orzo is made just like any other type of pasta, typically with flour and egg. Orzo is shaped like rice so the texture is very similar. Since both are so similar, you can use either one to make this recipe. I’ve noticed that the orzo holds its shape better and doesn’t crumble or get as overly saturate as rice can. It’s also easier to cook than rice. However, if you have an egg or gluten allergy, rice would make an excellent substitution for orzo in this dish and would also qualify this dish to be called “butternut squash risotto.” So now you know! Do you need a casserole dish to make this? Not really. This can be prepared on the stove top then transferred to a large serving bowl. I prefer to serve mine in an oven-safe casserole dish though so that I can pop it in the oven to keep it warm. You could also keep this warm using a crockpot. 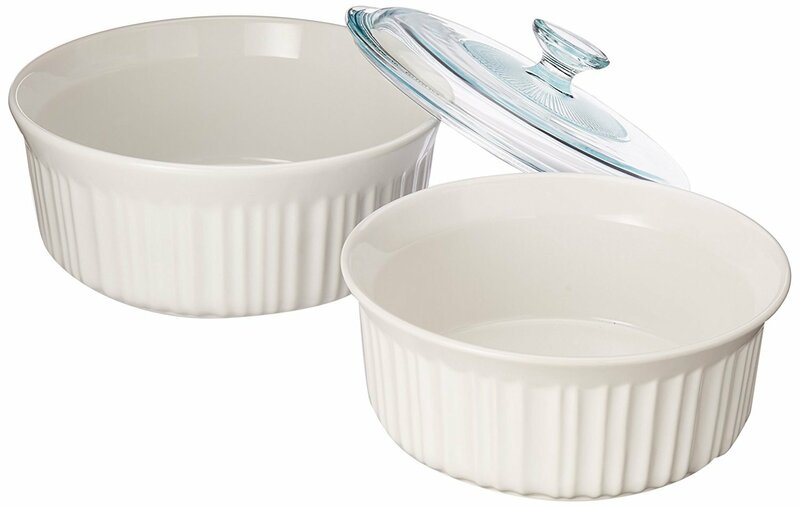 I really like the presentation of food in a white dish though and that’s why I typically serve my side dishes using my favorite Corningware casserole dish. The 2.5 qt dish is a good size for this recipe, leaving room to spare for scooping without a mess. The set is a good price and the large dish comes with a glass lid so it looks great on the Thanksgiving dinner table. This butternut squash orzo pairs so nicely with smoked turkey. 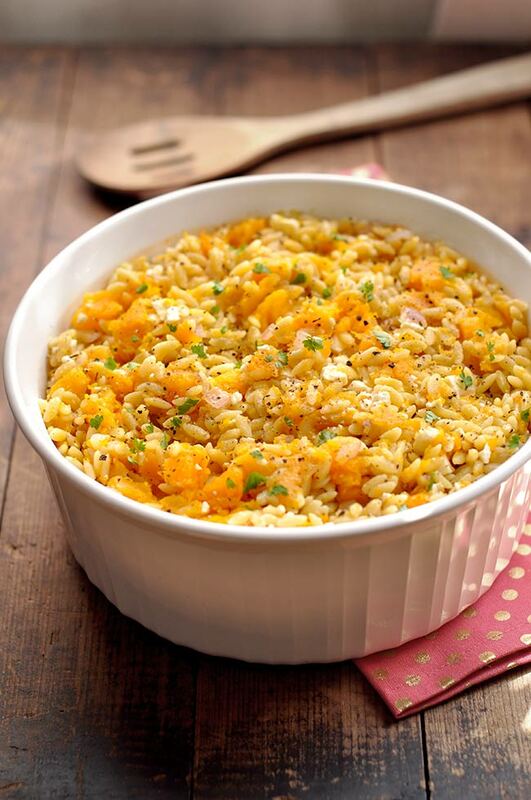 Just shred any leftover smoked turkey you have and toss it into this butternut squash orzo. The addition of turkey makes this into a complete meal in just one step and the flavor will blow your mind! By the way, if you’ve never smoked a turkey before, check out this how to smoke a turkey tutorial. It’s super easy but you will need a smoker. 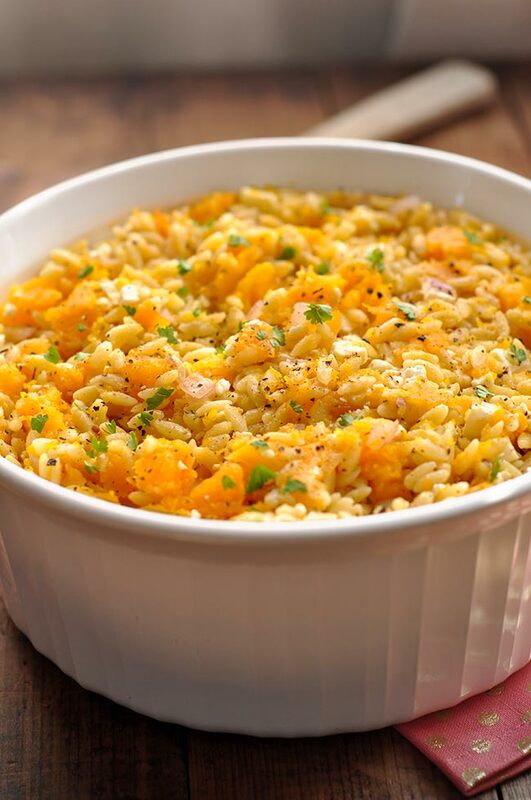 This recipe for butternut squash orzo was featured on Merry Monday and Meal Plan Monday’s Thanksgiving Recipe Round up! Looks delicious! Would this fare well being kept warm in a crockpot? Hey Kristen, I think this would be fine in the crockpot on warm. The only thing that might happen is the feta cheese may get melty. If you’re worried about that, you could wait to add that in a few minutes before serving. Thank you for the delicious recipe idea. It helped me to make a recipe that would suit my weird dietary restrictions due to Gastroparesis. I am sure that the original recipe is delicious. I only made half the recipe. For those who need to reduce fat: I used fat free chicken broth to cook the Orzo. I also used only 1 tablespoon each of butter and olive oil to saute the onions. I think I could have used half that amount. How many calories in this dish please? You can copy and paste the ingredient into this calorie calculator here: https://www.verywellfit.com/recipe-nutrition-analyzer-4157076. That will give you calorie count for the entire dish. Divide that by 12 to get the calories by average serving size. You can reduce the amount of butter and add a little bit of water instead if you’re looking to reduce the calories. Enjoy! What size bag of squash and what size pan? I may have missed this but when do you add in the feta cheese? Thanks! Hi Brenna, You can fold it in at the very end along with the butternut squash. You want it to be warm but not too melty. Thanks for asking. Enjoy!